Bangkok, Thailand- Resources allocated for development should be used effectively to achieve internationally-agreed sustainable development goals (SDGs). This was the message that members of the CSO Partnership for Development Effectiveness (CPDE) echoed loud and clear during their self-organized side event at the Asia Pacific People’s Forum on Sustainable Development (APPFSD). These resources (called Official Development Assistance (ODA) or simply ‘aid’ allocated by governments for poverty eradication in developing countries) will only fulfil its purpose if used based on development effectiveness principles. A number of realities however have been hampering this and CSOs call for urgent overcoming of these challenges. Atama Katama of the Borneo Dayak Forum and also the CPDE Asia Focal point quoted The Reality of Aid 2018 Report: “It is a moral, if not legal, obligation to allocate aid at the level of the longstanding ODA target of 0.7% of providers’ Gross National Income.” Atama also raised concerns on how ODA is increasingly being used to attract the private sector to invest in development and directly finance their initiatives, and to militarize development. 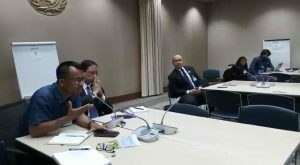 Expounding on militarization of development, Atama shared on the situation of West Papua, wherein military personnel are building ODA-funded infrastructure. Speakers and participants agreed that in order to contribute to the realization of the SDGs and to lessening inequality, exclusion, and disempowerment, the use of ODA must follow the principles of development effectiveness principles: democratic country ownership of national development priorities, focus on results, transparency, and accountability. This means that the people of developing countries are fully informed of and are the main decision-makers in the policies, programming, actual usage, monitoring and evaluation of ODA; that ODA is not just efficiently being delivered but actually brings about development; and that governments are accountable to the people.